Artist Steven Butler (penciler of Sonic the Hedgehog and former artist of Web of Spider-Man, Silver Sable, and The Badger) is responsible for the redesign. Stories will also be longer. The first tale sounds familiar — Veronica falls in love with a new bad boy in town, a handsome rebel who alienates her friends. I’m glad to see that the story will be written by a woman, Melanie J. Morgan (although I couldn’t find any mention of her online that didn’t refer back to this story, and she has no credits listed at comics.org). Requisite snarky comment: so Archie’s moving to issue-length stories and a more realistic art style… which brings them current with what happened to other American comics in the 70s. It’s about time for some freshening up. Even though I’m a fan of the Dan DeCarlo-inspired clean line work, their line has survived other style changes. Overall, I don’t think the look is as important in seeming modern as the stories and their subject matter. Want to become more current? Address those factors. If the story meets fan approval, look for the mini-series to be collected into a single volume graphic novel. Archie Comics public relations manager Rick Offenberger said the makeover is strictly an experiment to try an attract older readers and the art style will not be used on any other Archie series. Dorian sums up Newsarama reaction (so we don’t have to look, although this is probably the most attention that those kinds of comic readers have paid to Archie in decades). The idea gets some interest from non-fan Kalinara. Mike Sterling doesn’t care much. He hits on an important phrase, though: “contemporary teen romance/comedy”. That’s what they need to be aiming for in terms of story content. 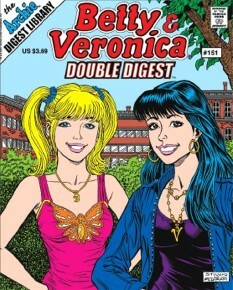 Betty & Veronica Double Digest #151 is scheduled to be released May 14, 2007.